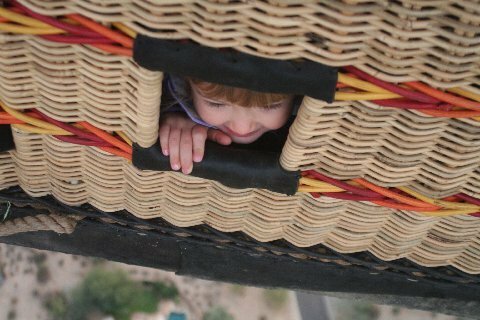 Experience a hot air balloon ride in sunny Phoenix, AZ. We offer sunrise balloon flights for small groups and private parties. Learn more! We'll meet near the Deer Valley Airport and drive to our launch site together. Here, we'll lay out the balloon, turn on the fans, and watch your balloon slowly come to life. When we're ready to fly, we'll hit the burners and your aircraft will stand. Climb in the basket and get ready to soar. This is the warmest part of your entire journey, as we'll heat the balloon until it has enough lift to float away. Your take-off is so gentle you're unlikely to feel the earth moving away from your feet. From the air, you'll have unrivaled photo opportunities: take in the desert, the mountains around the valley, the rivers, the lakes, and the wildlife. Enjoy the sensation of being able to see for miles and an opportunity to experience flight without noise. Besides the intermittent roar of the burners (and Kevin's storytelling), you'll travel above the valley of the sun in silence, giving you the perfect opportunity to take in the serenity and the remarkable view from the sky. Your flight ends with a traditional champagne (or mimosa) toast and conversation centered around the experience you just had. You'll have met new friends, had an amazing adventure, and made memories that will last your lifetime. While we do offer sunset flights in the winter months, most of our flights launch in the morning with the sunrise. Exact flight time changes depending on the time of year, but we'll let you know when to meet when you call and set up a reservation. Where do you take off? Our launch location changes depending on the wind speed and direction. We have a few launch sites located throughout the North Phoenix area to provide the most scenic rides possible based on the wind conditions on the day of your flight. Don't worry though: we always have the same meeting location. How many people do you take in your balloon? 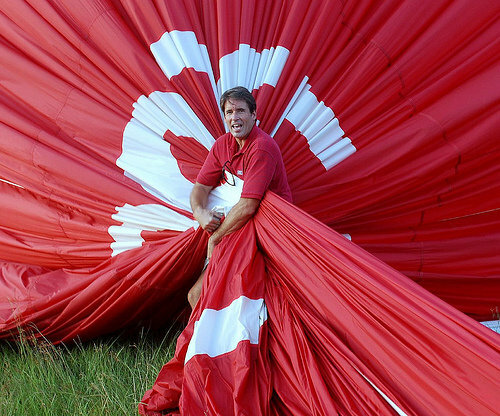 At 2 Fly Us, we only take small groups of no more than four people on our balloon flights. This means that for our standard flight, it's usually two couples plus the pilot (someone has to fly). For private flights, your private party (up to four people) has the entire balloon and pilot to yourselves. No matter which flight you choose with 2 Fly Us, you can count on a personalized experience: we enjoy getting to know our passengers, and this is only possible in a small group setting. How much is a hot air balloon ride? Please check out our pricing. Wear comfortable clothes, as you would dress for the weather on the day of your flight. Avoid high-heels or flip-flops: you may be walking around in desert terrain depending where we launch and land. Tennis shoes are best. You might also like to bring a hat (the burners give off some heat), but it's not necessary.